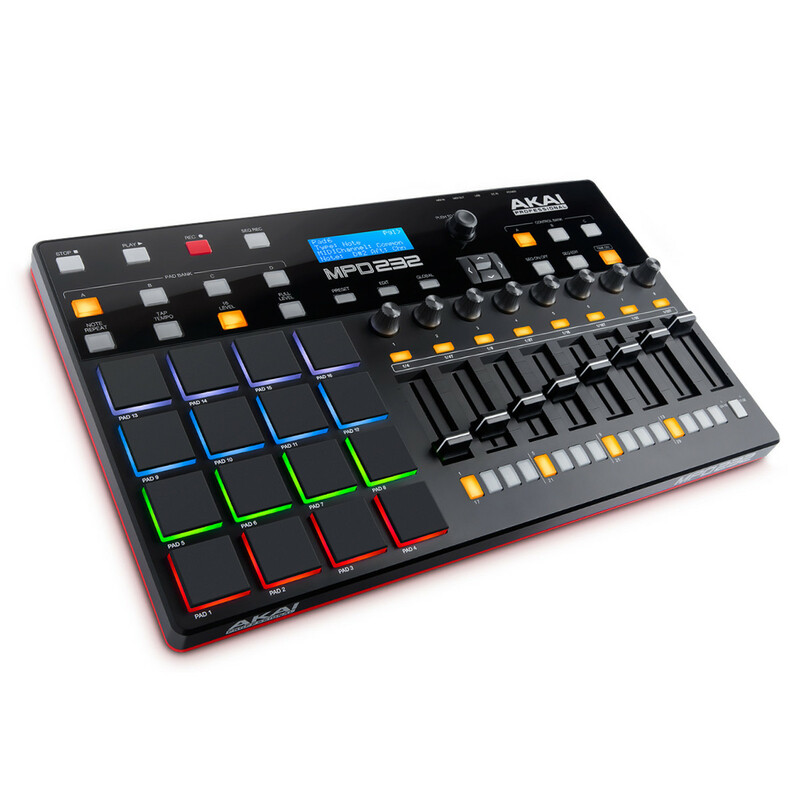 The Akai MPD232 Pad Controller with Faders is part of the most capable and user-friendly line of pad controllers Akai Professional has developed to date. 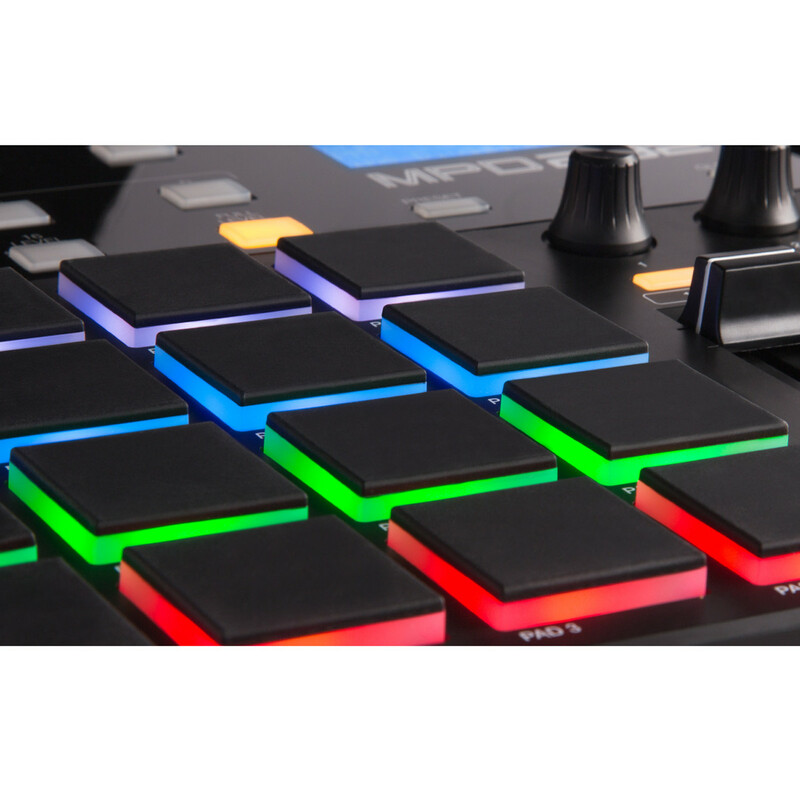 Featuring RGB light-up MPC pads and a greatly expanded control set of 8 knobs, 8 faders, 8 buttons in 3 banks for 72 total controls, the MPD232 allows musicians of any level to enhance their performance right away with the easy-to-use Preset Editor. User interaction is amazingly responsive thanks to the new, ultra sensitive Thick Fat MPC pads, and with the convenient USB power, there's no need for an AC adapter. The Akai MPD232 is the product of over six years of detailed customer research and user feedback, featuring an expanded control set to maximize the sounds and effects available to the user, and comes complete with Ableton Live Lite. 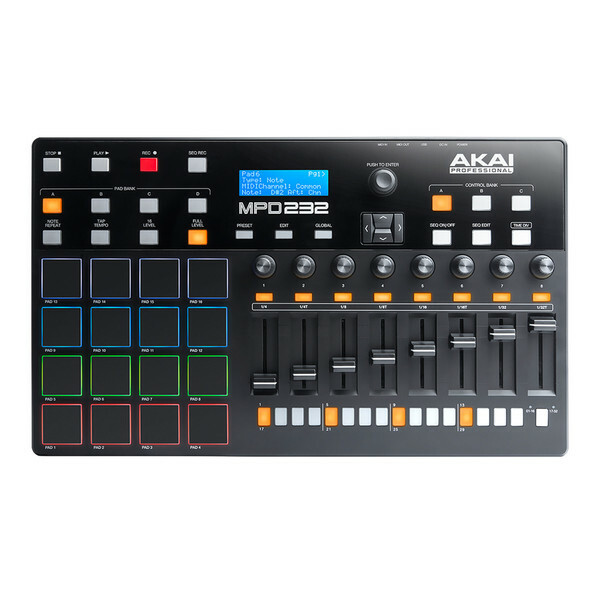 The Akai MPD232 Pad Controller with Faders is a compact yet powerful production system featuring 16 thick RGB backlit MPC pads as well as 4 assignable faders for that authentic vintage MPC feel. The backlit pads help in low light environments, perfect for live and studio performances. The velocity-sensitive pads give you optimal control over your samples, allowing you to trigger everything from drum hits and loops to vocal shots and FX, the MPD232 Pad Controller gives you everything you need to create complex productions and performances. The pads are configured in 4 banks, giving you a total of 64 assignable pads, allowing you to switch between banks for complex live sets as well as allowing you to arrange your samples. The MPD232 also includes 30 presets in total with configurations set for the most popular DAWs on the market, allowing you to get started and creating straight away. The wide range of pads, faders and assignable parameters gives you optimal control over every aspect of your soundbanks and productions. The 8 assignable faders also come complete with 8 assignable Q-link knobs and 8 assignable Q-Link buttons. This wide range of functions, gives you access to every part of your favourite DAW, allowing you to do everything from add automation and affect the pitch to control virtual instruments and create complex rhythms. The 64-part, 32-step sequencer allows you to create rhythm patterns which can be used to control pad events and trigger loops. The 72 assignable controls are accessible via 3 banks, allowing you to assign and control your favourite functions in any compatible software. The MPD232 also features dedicated transport controls and classic MPC-style functions including: MPC Note repeat, MPC Swing, 16 Level, Full Level and Tap Tempo. 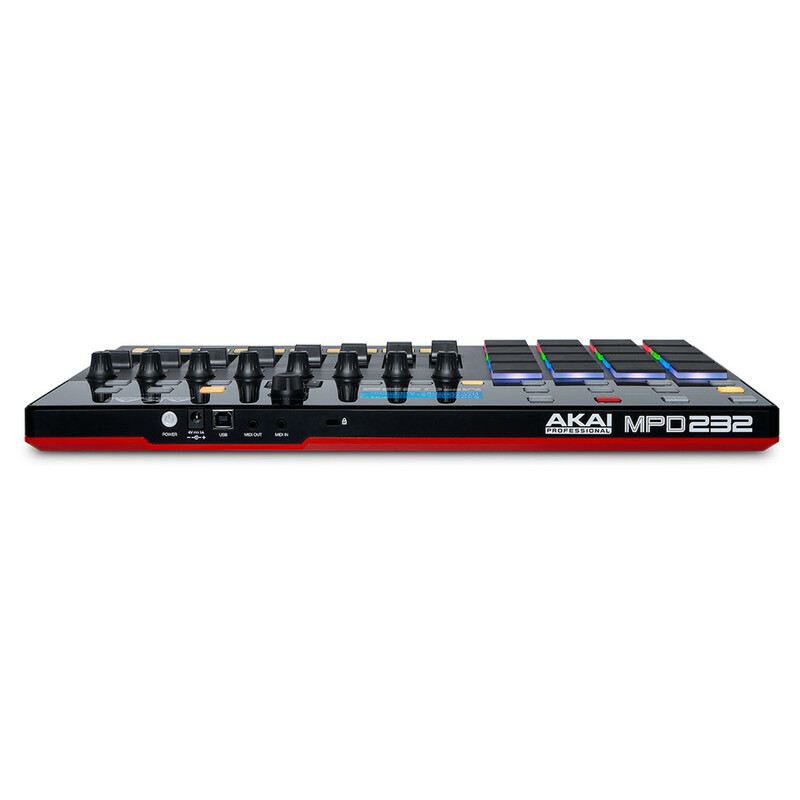 The Akai MPD232 production unit features an integrated plug-and-play USB interface, compatible with both Mac and PC, eliminating the need to install any drivers. MIDI In and Out jacks are also included for controlling external gear, giving you the ability to connect other instruments and sound modules directly to your MPD232. The built-in USB connection is also used to power the MPD232, eliminating the need for external power supplies (which can also be used in live situations). In addition to the improved functionality, Akai have also added iOS compatibility using the Camera Connection Kit (sold separately), allowing you to connect and use your MPD232 with a range of iOS devices. The MPD232 comes complete with over £300 worth of software, allowing you to get started straight out of the box. The bundled software includes: Akai Pro MPC Essentials, Big Bang Drums, Bang Cinematic Percussion from Sonivox, Ableton Live Lite, and Software Preset Editor. This versatile range of software provides you with high-quality samples and the means to produce, record and arrange your MPC232 performances with ease.